1) Acting – Total Thumbs Up: If you look at the cast, most of them are young actors. The fabulous part about this is that the actors they chose sound very much like the voices in the old Peanut specials on TV. Everyone does a great job. Loved Bill Melendez – he’s been doing Snoopy’s and Woodstock’s voices since 1966! Noah Schnapp was darling as Charlie Brown. Anastasia Bredihina was a perfect Peppermint Patty. Trombone Shorty took on the task of the Wahwah adult voices. (The film site has a link to a Wahwah machine. You can even share the wahwah for the words you type in. Too cute!) Lovely work by all! The studio normally does great work, but I think they went all out for this one. Charles M. Schulz and all the TV specials have a certain style and feel. Not only did Blue Sky Studios take that on, but they also decided to do this film in 3D! And it was marvellous! Despite the textures and the 3D depth, they made sure to keep all the bits from the actual strips – thought bubbles, Woodstock’s flight trails, the facial expressions and eyes made with a drawn pencil lines, and more. 3) Plot/Story – Total Thumbs Up: Peanuts is a comic strip with years upon years of content, dozens of TV specials, and more. 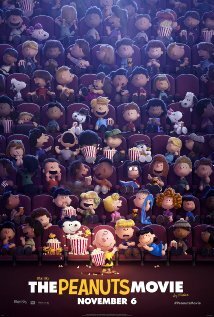 And Blue Sky Studios managed to pick all the nuggets which bring out all the best of Peanuts and presented them in a way that would not only tickle fans of the comic strip and TV specials, but also make it easy for those who’ve never seen The Peanut’s world before to fall in love with it. All the iconic stuff is there: the kite eating tree, the pitching mound, Lucy’s psychiatry stand, the football, the typewriter, even the Great Pumpkin is mentioned. But best of all – lots of the Red Baron! We even end up with a story inside the story, as Snoopy plays out some of Charlie Brown’s own troubles as the World War I Flying Ace and finds his own cute girl to fancy. Several elements were even shown as this being where they began. The way they threaded in the Red Baron was brilliant! They made him a force to fear in reality as well as in Snoopy’s imagination. Lovely! 4) Music – Total Thumbs Up: The Linus and Lucy theme of old is brought back to help give us waves of nostalgia (plus it’s really a catchy theme!). They even brought in a clip from one of the specials – the caroling scene song – “Christmas Time is Here”. Several of these bits were from the original scores by Vince Guaraldi Trio. Christophe Beck kept his part of the score light and airy and it blended quite well with the original scores – he even gives his own twist to the Linus and Lucy theme. All the music worked very well together.